Lower your thermostat and your heating bills while cleaning the air you breathe with Seasonaire. It is a heater and air purification system built into one. Seasonaire is a ceramic infrared heater with a HEPA air filter, UV air purifier, ionic air freshener and humidifier. It is much more efficient than common coil heaters since it can heat a room up without drying the air and making it hard to breathe. The Seasonaire is rated at 5,600 BTU and can heat up to 1,000 square feet. It only cost pennies per hour to operate and you can easily roll into the room you want with the portable design. The design combines ceramic heating technology with infrared heat and a dual speed fans to circulate air throughout the entire room quickly and efficiently. There’s also a HEPA Air Filter, UV Air Purification, Ionic Air Freshener and Humidifier built into Seasonaire. They will remove dust, pollen, and allergens from the air, kill harmful bacteria, and make the air much fresher. You can use the air purification function without turning the heater during the warmer months of the year. You can place the Seasonaire anywhere in a room you like, not just the middle, and it will heat the entirely room evenly. With other ordinary heaters they only heat the area directly in front of them. But the Seaonsaire circulates the warm air around the entire room. The Seasonaire will always remain cool to touch since the ceramic heating technology and the heating element never reaches combustible temperatures. You won’t ever have to worry about children or pets touching the heater by accident and getting burned. Plus the Seasonaire will automatically shut itself off when tipped over for additional safety. 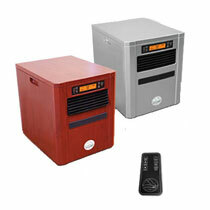 The Seaonaire Heater and Air Purification System is available in a Matte Silver finish or a Cherry Grainwood finish. Each one retails for about $400 with free shipping and handling. With this current trial offer you can try the Seaonaire for 60 days first in your home by paying just $39.95. Only after the 60 day period if you decided to keep it, then just make 4 monthly payments of $89.95. I am looking for a replacement hepa filter for my seasonaire unit? can you help?? ?